amanda mcclements & metrocurean: Chef Five Bites: Jaime Montes De Oca Jr. 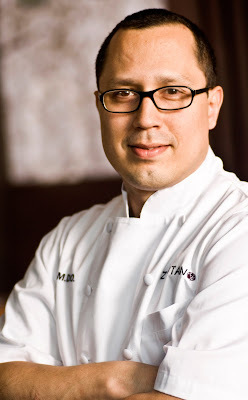 Chef Five Bites: Jaime Montes De Oca Jr.
Jaime Montes De Oca Jr. was tapped by chef Susur Lee (check him out on Bravo's Top Chef Masters) to head the kitchen at Zentan when it opened last year in the Donovan House. Before arriving in DC, Montes De Oca was executive sous chef at Lee's restaurant Shang in New York City. He has also worked at Gramercy Park Hotel, Tocqueville, Opia and Bandol. Masa 14 looks really tasty! I am not really clear if its a small plates place or not because of their 24.99 special for 3 of any plates from their menu-including entrees (so you can get three entrees?). I happened to try the Deli Chicken Salad Sandwich at Daily 14. The place is a regular small sandwich shop, nothing fancy, but its chicken salad made me an impression at that time. Now, I am thrilled to find out such an well-know chef found it yummy, too! It definitely worth a try!! jhimmel1: Masa 14 is small plates, and that's a great deal with wine! Anon: Two shouts for the chicken salad? Sounds like I need to try it!